Choosing a defined layout will arrange all images based on a named layout (e.g. 'Quarter Page'). Both size and position are automatically set. You can not resize images. However you can reorder and rotate them. You can also your own layouts and save them as a defined layout. See Saving Layouts. The 'Image Layout' option on the 'View' menu will make the layout visible (this requires that 'Simplified Interface' is unchecked). 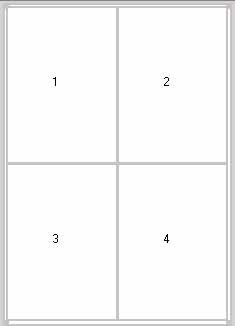 Images will be placed in the numbered rectangles, starting with rectangle 1.